The local rail service from Edinburgh to Berwick, together with the re-opening of the two stations at Reston and East Linton, may not now happen until 2018, despite previous intimations that this could happen by December 2016. RAGES are extremely disappointed by this, and concerned that the service and the new stations may not materialise, despite their almost twenty years of campaigning. 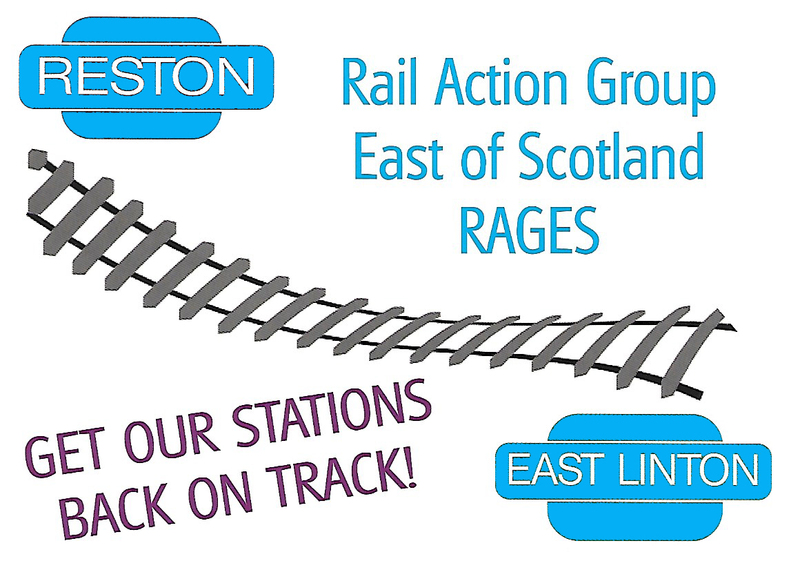 RAGES are asking people to campaign with them by downloading a postcard, printing, signing and returning to the Transport Minister, asking him to ensure that our local service and our stations are Kept on Track. Working together, we WILL keep our stations on track! RAGES have also created a letter which you might like to use as a template to send to your local councillor, MSP or MP (or all three! ), encouraging them to press for better rail services in your area. The families of three youths who died following a road collision in Tyninghame, East Lothian, have paid tribute to them. Jenna Barbour, aged 18, 15-year-old David Armstrong and 16-year-old Josh Stewart, who are all from Dunbar, sustained fatal injuries following the incident, which happened around 8.20pm on Monday 25th November. All three families have now issued statements via Police Scotland. We have been left completely devastated by the death of our beloved Jenna, who was a dearly loved daughter, sister and friend. Having only recently left school, Jenna had her whole life in front of her and had been saving for a trip to New Zealand, which was her dream holiday. Jenna had been working extremely hard to save for the trip and when she wasn’t busy working at her part-time jobs, she loved horse riding and was very accomplished at the sport. As well as regularly spending time practising, Jenna also volunteered with the Riding for the Disabled charity. We were all immensely proud of Jenna and everything she achieved in her life. She was always a delight to be around and the family each have very fond memories of our holidays together. To lose someone as special as Jenna has left a huge hole in our hearts and we ask that our family be left alone to grieve at this incredibly difficult time. Our family is still in a state of complete shock following David’s death and we are struggling to come to terms with our loss. David was a kind-hearted and good-mannered boy, who was always respectful of adults and his peers and was a loving brother to his sister. He was athletic, enjoyed playing computer games and had a cheeky wink that made him such a wonderful person to know. We are grateful for all the kind words of support we’re receiving at this time and would like to thank our family and friends for their condolences. However, we would like to grieve privately at this time and ask that we be left in peace to do so. Josh was a much loved son, nephew, grandson and cousin, and a loyal friend. He was a joy to anyone who knew him and the people that met Josh and his smile would never forget him. Josh lived for rugby and the gym. He was still looking to find that elusive six pack. He will be sorely missed. It’s time for the community to pull together in this very difficult time. My heart goes out to all families involved at this time of great sadness. Enquiries into the full circumstances surrounding the collision are ongoing and anyone with information that can assist Police Scotland with their enquiries is asked to contact 101. A Dunbar resident who penned a story about her most treasured possession for a national writing competition has had her submission chosen to be published in a book. Hannah Lavery beat off competition from over 300 other entries to win a place in a special book entitled Treasures, and her story ‘Still your treasure…’ will feature alongside entries from 40 other winners and celebrity contributors such as John and Carole E. Barrowman, Denise Mina and Mairi Hedderwick. Still your treasure’…was written as a love letter to my husband. My husband and my children are what I treasure most and my Clash t-shirt, the object treasured, is a reminder to myself of what is really important. The competition was held by Scottish Book Trust, the leading agency for the promotion of literature, reading and writing in Scotland, and encouraged members of the public to write, read and share stories about an object that is special to them. Contributions arrived in a variety of forms including poems, diary entries and stories, and these previously untold accounts of unexpected objects included pieces about a steamship, a VHS tape, a rucksack and a chip of concrete. To celebrate the second year of Book Week Scotland (25 November – 1 December 2013) more than 150,000 free copies of Treasures will be gifted to people throughout the country. The books will be distributed in local bookshops, public libraries, National Trust and Historic Scotland properties, workplaces, ferry terminals and train stations. All the competition entries are also available to read at www.bookweekscotland.com. Treasures also features original commissioned contributions from some of the best-loved names in Scottish arts and literature, among them exclusive stories from Richard Holloway and Mairi Hedderwick. A special contribution in Gaelic comes from Catriona Lexy Chaimbeul. The winning stories from the Treasures campaign give a fascinating and heart-warming insight into the valued objects that have shaped people’s lives in Scotland, and we are delighted to be able to publish them so that they may be enjoyed by others and, most importantly, may never be forgotten. Police in East Lothian are appealing for witnesses after a two-car collision on the A1 this morning (Friday August 16). The collision happened around 11.40am, on the A1 at Thistly Cross, near Dunbar. A red Citroen Picasso heading south collided with a lilac Citroen Picasso heading north. The female driver and the female passenger of the red Citroen Picasso were both taken by ambulance to Edinburgh Royal Infirmary with serious injuries and the driver of the lilac Citroen Picasso received minor injuries. I’d like to thank those who stopped to assist and acted as witnesses at the time of this accident, but we would like to appeal for any other witnesses to come forward.